The RFI kit is designed to be installed on your radio transceiver to reduce Radio Frequency Interference (RFI) caused by common mode current on the outside of the coax braid at the output of your radio. Additional chokes are included to reduce common mode currents on the amp relay keying line (7 pin Din), rear audio in/out for digital modes (13 pin Din), computer control line (DB-9) and the DC power cord. 1. “Hot mic” RFI caused by poor grounding of antennas or common mode currents from linear amps feeding unbalanced (coax fed) antennas without baluns/line isolators. 2. RFI to neighbor’s electronic devices including audio/video systems, computers, telephones, garage door openers, etc. 3. RFI to your other radios, audio/video systems, computers, telephones, etc. A side benefit is a reduction in noise floor in your receiver depending on the amount of noise being introduced by common mode currents (which are blocked/reduced by the chokes in this kit). 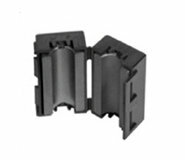 These chokes use a special mix of ferrite core material that is effective in suppressing radio frequency interference from Ham Radio amplifiers. The split beads beads are easy to use, don’t require modification of the protected equipment and work in almost all cases, even when plug-in filters fail. This kit is designed to choke common mode currents going into or exiting from your transceiver. Chokes are supplied for the RF Out (1 antenna only), Amp Relay Cable (7 pin DIN), Computer Control Cable (DB-9), PSK31/Digital Mode Cable (13 pin Din) and DC power line. Use of the chokes often helps cure SWR problems between transceiver and a linear amp and between transceiver and antenna tuner or direct to antenna. The DC power line choke helps keep common mode current out of the power line which could cause interference to other devices connected to the same power line if not suppressed. Also make sure you connect a good RF ground to the transceiver ground post. Note to Flex Radio users: Use snap on ferrites for firewire cable, speaker cable and mic cable, Ring ferrites for Antenna output and DC power. For additional RFI suppression, use a feed line choke at the antenna to suppress common current on the coax feed line – see our store for feed line choke alternatives for use at the antenna. If you use a linear amplifier we have RFI kits for linear amplifiers that help suppress RFI in your shack or in your neighbor’s house. Mobile RFI kits work two ways: They suppress RFI from on board computers and other sensing/control devices in your vehicle that may cause your radio to be a VICTIM of RFI, and second they suppress RFI generated by your radio as a SOURCE which may affect your on board computers or other devices. Mobile operations of HF radios (1-30 Mhz) tend to experience more RFI effects than VHF/UHF mobile stations. If you have both HF and VHF installations in your vehicles, you may need both kits. To address separate solutions we have developed two separate RFI kits: one for HF (1.8-300 MHz) mobile installations and another for VHF/UHF (30-1000 MHz) mobile installations. Each kit uses the appropriate ferrite mix for the frequency range desired.